Reimagined online content and tools support teaching and learning more effectively. 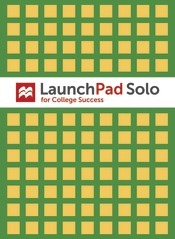 LaunchPad Solo for College Success, our digital course space, combines high-quality multimedia content and ready-made assessment: a trove of videos, our LearningCurve, adaptive, game-like study system, and more. Our gradebook offers a window into your students' performance, a streamlined interface helps students focus on what’s due next, and social commenting tools let them engage and connect. LaunchPad integrates with your school’s learning management system or you can use it on its own.